Any servo based Pan & Tilt gimbal should work. Ideally the system should allow 180 degrees of pan rotation in both directions and 90degrees of pitch both up and down. The servos used can either be regular servos that translate the PWM input into an absolute angle or continuous rotation servos. The flight controller board (i.e. 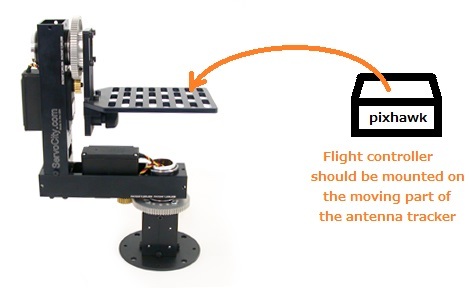 Pixhawk, APM2, etc) should be mounted on the moving part of the antenna tracker. If possible align the front of the flight controller so that it points exactly in the direction that the antenna is most sensitive. 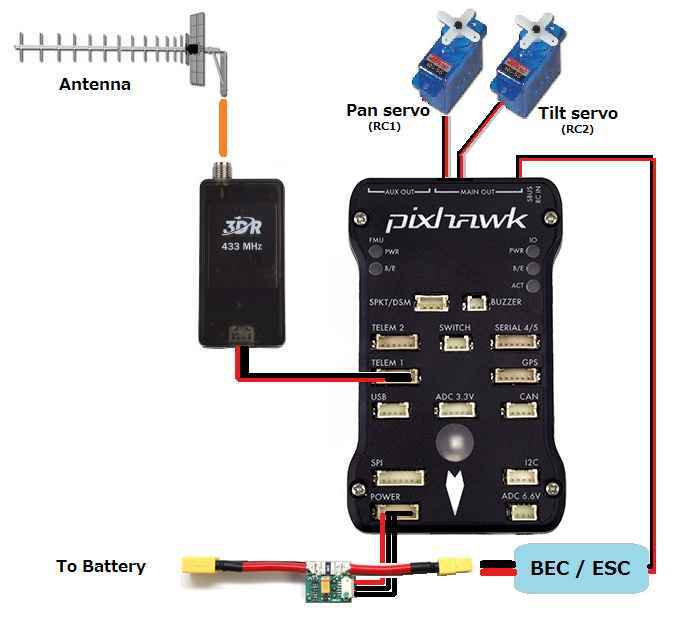 So for example, if using a Pixhawk controller and a Yagi antenna, the arrow on the top of the Pixhawk should point in the same direction as the antenna. Alternatively the flight controller can be mounted at any 45deg or 90deg angle to the antenna and then the AHRS_ORIENTATION parameter can be changed to account for the difference. See the configuration page for more details. 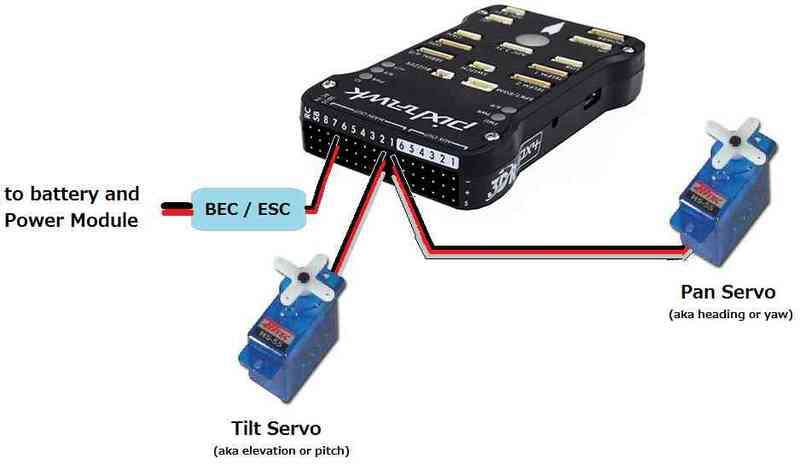 The Pan servo (controls the tracker’s heading or yaw) should be connected to RC1, the Tilt servo (controls elevation or pitch) should be connected to RC2. A BEC or ESC should be connected to any of the other RC outputs as shown to provide power for the servos. The Antenna should be attached to the radio after first removing the radio’s di-pole antenna. Note that the 3DR and RFD900 radios have a RP SMA Male adapter (RP = reverse polarity) while antennas can come with a number of different connectors meaning an adapter (such as this RP SMA Female to SMA Female adapter) may be required. If using a GPS+compass module it should be mounted so that the arrow on the module points in the same direction as the antenna. If this is not convenient, the COMPASS_ORIENT parameter can be used to account for this. See the configuration page for more details. Care should be taken to ensure the compass is not close to any metal objects. If using a stand-alone GPS (i.e. not an integrated GPS+compass) the GPS should be positioned so that it’s antenna has a clear view of the sky. It’s heading is not important. Some care should be taken to ensure the cable connected to the flight controller cannot become tangled.